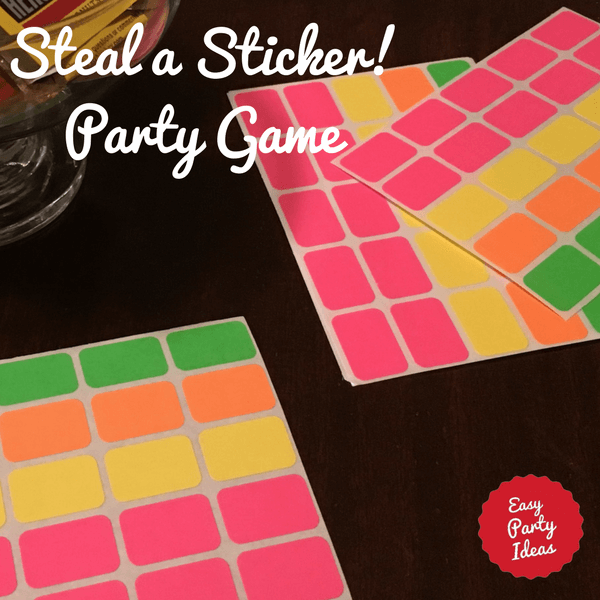 Steal a Sticker is what I call this adult party game, which is a great ice breaker game where you steal stickers or other items from each other. This is a party activity that really gets your guests moving about the room and meeting everyone. That is what an icebreaker is all about, right?! What is even better about this game is that it is SO inexpensive to set up. As a matter of fact, you may already have the supplies you need! We played this at a party that I helped with a few years ago. There were about 20 people there, and it was pretty funny, as some of the guys went to great lengths to avoid having their stickers taken, meanwhile some were very competitive about stealing stickers! This game is easy to plan...but sometimes can be hard to win! Read on for more details! Ready to Play Steal a Sticker? Don't worry, I'll help you with everything you need! As each guest arrives, place the 10 stickers for him/her on their back.These stickers should be unique to each player. For example, player 1 has green stickers, player 2 has blue stickers, player 3 has kitten stickers, etc. When ready to play, pass out an index card to each guest. Each guest must try to "steal" a sticker...one from each guest...without getting caught! The first guest who has stolen a sticker from each person who is at the party wins a prize. As each guest arrives, place 10 stickers for him/her on their back.These stickers can be any 10 stickers; they don't have to match or evey e a specifc theme. Each guest must try to "steal" a sticker...without getting caught! The first guest who has stolen a sticker from ten people wins a prize. For inexpensive stickers, check at your office supply or school/office supply section of your favorite store. They often have stickers in all sorts of colors. You also don't have to limit yourself to stickers that are colored. You can also check your dollar store for stickers in various themes - cats, dogs, trucks, flowers, etc. Another idea for stickers it to get file folder labels, and put the person's name on the labels. 10 labels for each person's back. This might actually be the easiest way to tell, if you have a large number of players, if you have one sticker from each person or not! Do you have any great easy party ideas and games? If so, tell us about your favorite games like steal a sticker! I would love to add your ideas to the site!